I have professionally cleaned carpets and upholstery for over 20 years. If your establishment needs a freshen up or a problem solving deep clean Arena Cleaning Services have the knowledge and experience to fullfill your requirements. 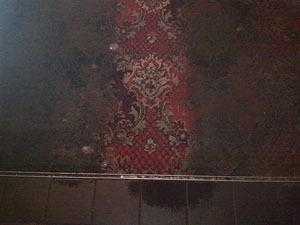 I am sure you business would benefit from professionally cleaned carpeting and upholstery. please use our contact form here to request a FREE call back or call 01263 833424 now or email here. Enhance the first impression for your customers. Maintaining your carpeting with regular cleaning is an investment for your business, by removing the grit deep in the pile that cause premature wear deep professional cleaning will extend it's life considerably. 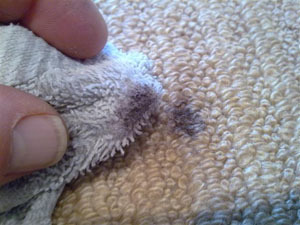 I like to compare it to servicing your car or boiler, we can not expect either to function correctly without regular servicing, but we expect so much more from our carpets and upholstery and in this economic climate we are all trying to avoid unecessary expense, clean it today and it will serve you tomorrow. 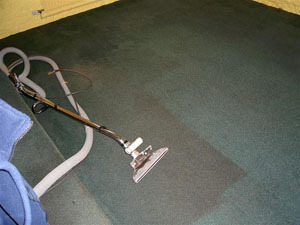 Restaurants, pubs, property landlords, shops, offices, guest houses, schools and prestige hotels rely on us to restore their carpeting and safe guard their investment We can remove ingrained dirt, grease and food and even restore carpeting that looks like a tarmac road, referred in the trade as 'black top' Picture left and above. Some companies shrink away from this type of cleaning yet we have great success using our advanced cleaning systems.These can be extreme examples but if I can achieve these results consider what we can do for you. We are Woolsafe aware. I have a choice of solutions that are specifically designed and recommended to work with wool, wool rich and blended carpets, these solutions are also suitable for synthetic. When we clean we restore the carpet to its natural state, no harmful residues, no re-soiling. Our commercial clients trust Arena to clean and maintain their standards for their guests, customers and users and it's my job to safe guard that investment by cleaning them properly. We take health and safety seriously and following a site visit will supply a risk assessment with our quotation. Necessary signs will also be in evidence to keep your customers and staff safe. In most cases we would recommend hot water extraction cleaning as part of our 8 step programme. We would usually do this out of your normal opening hours to cause minimum disruption. We also have a range of low or very low moisture cleaning systems including rotary cleaning and dry powder cleaning. All these systems have their place in a given situation and we would be happy to advise. A link to some of our equipment. All calls are diverted to my mobile free of charge. If unavailable please leave a simple message of a contact name and number and I will return your call as soon as I can. please remember not to with hold your number or include it in the text.